Doyle's Marley Olivier threw a two-hitter with seven strikeouts in Monday's Class 2A regional playoff win over Ville Platte. Doyle's Elise Jones is all smiles as she gets congratulated by Lady Tigers coach Amanda Decell a triple against Ville Platte. 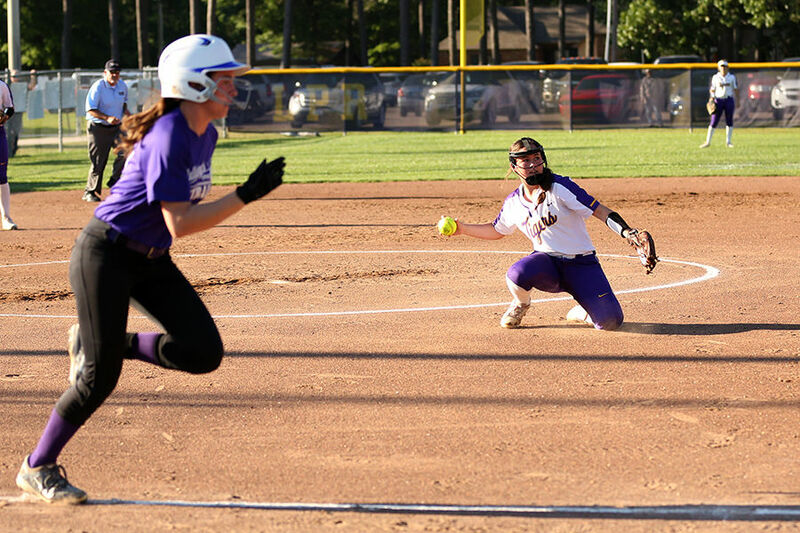 Lady Tigers pitcher Marley Olivier stops the ball and makes a throw to first ahead of a Ville Platte runner. Sydney Taylor of Doyle makes the catch and the third out on a high deep fly ball to center field. Ville Platte third baseman Ken Doucet waits on the throw as Doyle's Elise Jones slides safely into the bag. Doyle's Kylie Merrell crosses the plate early in their game against Ville Platte on Monday. 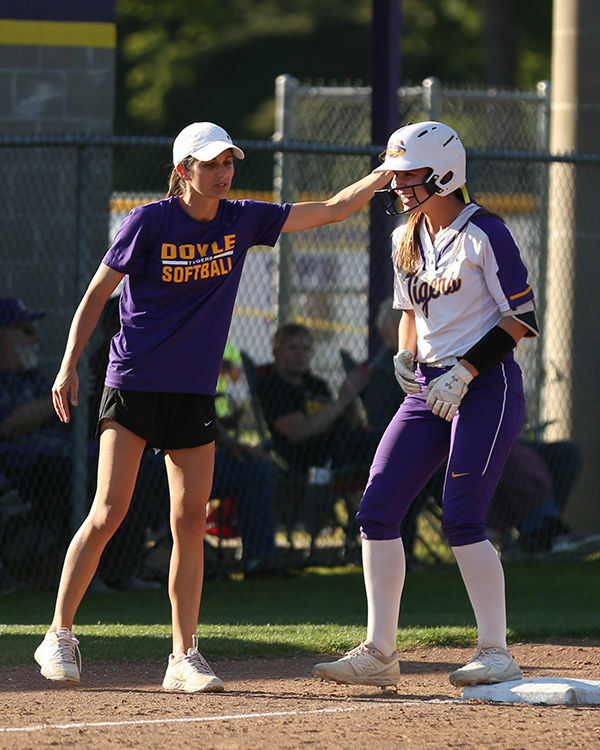 Doyle got a combination of solid pitching and hitting to roll past Ville Platte in the regional round Monday of the Class 2A playoffs. 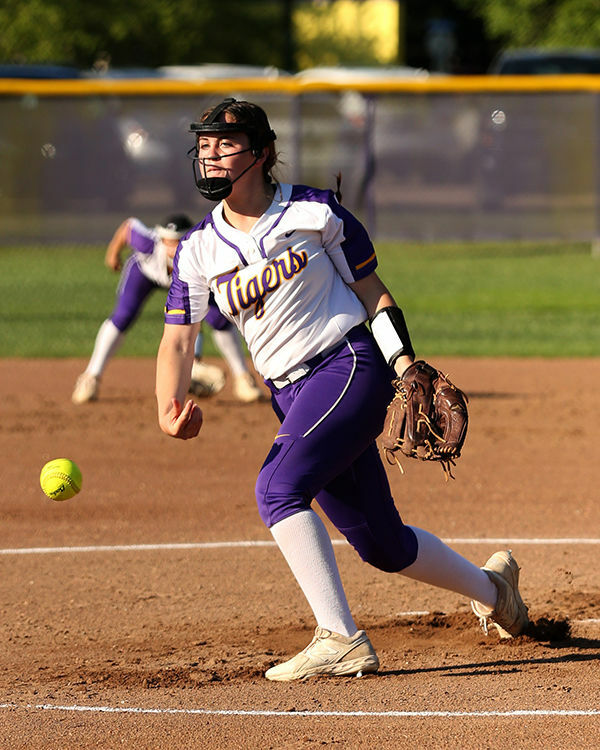 Marley Olivier hurled a two-hitter, while the Lady Tigers backed her with 11 hits in a 10-0 win at Johnny Sartwell Park. No. 2 Doyle advances to the quarterfinals to face the winner of Tuesday’s game between No. 7 Avoyelles Public Charter and No. 10 Pickering. The Lady Tigers struck early with Gabby Lucia getting a one-out single in the top of the first, stealing second and moving to third when Sydney Taylor reached base on an error at second. That set up Madison Diaville’s single to short left field for a 1-0 lead. Elise Jones tripled to center field, and Olivier singled her in for a 3-0 lead. Doyle padded the lead with a run in the second when Rylee Lambert singled up the middle and later scored on an error in left field for a 4-0 lead. The Lady Tigers broke the game open with a six-run third, combining four hits with five errors for a 10-0 lead. Jones had a lead-off double to start the inning, and Lambert, Kaitlyn Savant and Diaville had singles. Olivier struck out at least two batters in three innings, and Ville Platte didn’t get its first hit until Ken Doucet’s one-out single in the fourth. Hailey Bordelon got a one-out single in the fifth and Josey Hoidoin walked before Hanna Monier flied out to Taylor in center field to end the game. Diaville, Jones, Olivier and Lambert each had two hits for Doyle.